Home > DIY Design Inspiration > Outdoor > Creative Ideas for Outdoor Living Spaces! Creative Ideas for Outdoor Living Spaces! Now this may be taking my obsession of shoes a little far but I absolutely adore them! 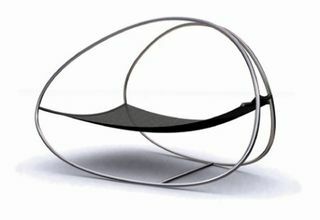 These girlie loungers are hand-crafted and employ Sunbrella fabric, making them water resistant. You will definitely rock it at your next pool party with these stilettos! Kalamazoo Outdoor Gourmet specializes in outdoor cooking products. When I was at the Kitchen and Bath Industry Show in Vegas recently, I stopped by their booth. I was intrigued by this countertop pizza oven because I LOVE pizza! Doting a price tag of $6,500.00, you better REALLY love pizza to order this one. 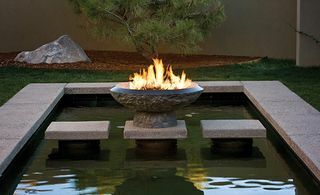 Fire and water have become a popular favorite in outdoor spaces. The soothing sound of running water is relaxing to the soul and fire is equally warming to the heart. I love designing outdoor areas which feature all the elements of nature. This is one of the latest designs I am working on for an oceanfront home. I am creating a meditation garden and a wall made of volcanic stone. 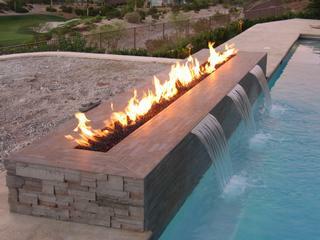 My fire/waterfall will cantilever out from the wall and the water will fall into a reflecting pool of water. The fire will ignite in a linear stream at the point of the falling water. This is a creative way to exhibit a fire pit. A fire pit does not have to be something you simply sit around. It can be a beautiful focal point in a garden, as shown in this picture. Here is a creative way to display a waterfall. 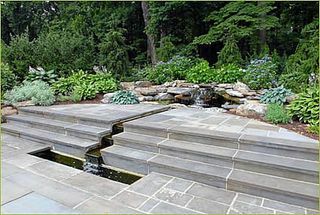 The water trickles down the stairs which leads to the outside space. It creates the gravity to make this application easy. I love the sound of running water and the peacefulness it adds to the outdoors. In a 10-ounce glass (such as Collins or highball), stir together lime juice and sugar until sugar dissolves. Add 1/4 cup crushed ice. Rub mint leaves over rim of glass, then tear leaves in half and add to glass. Gently stir for 15 seconds, then add rum, remaining crushed ice and club soda. 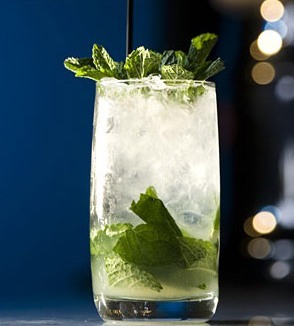 Gently stir for 5 seconds, then tuck mint sprigs into top of glass and insert tall straw. Enjoy your outside summer fun!